My work is available for purchase at art shows and retail locations, at my programs and workshops and by contacting me. Note that work featured on my website may have already been purchased. If there is a piece you would like to inquire about, contact me. Textile - "Creating your Own Fabric"
"Fun with wool and other fibers"
"Building Your Own Fiber Arts Wardrobe"
“Now that I have learned some textile techniques, what do I do with them?” This question is explored in the program, “Creating Your Own Fabrics”. Jackets, coats, vests, capes, shawls, scarves, purses, hats, sweaters, wall pieces, vessels and/or quilts are presented along with a discussion of the techniques and tools used in their construction. There are many techniques that can be included in your program. Let me know your interest and time restraints. Note: times listed are approximate. Examples: Jackets, coats, shawls, scarves, and quilts. Program needs: clothing rack, table/s and three to four models to wear and/or hold the items being shown - most garments are sized between medium to extra large. Contact me for program fees. ​If you want to design your own fabric, make unique garments, scarves, shawls, or purses, sew a quilt that is distinctly yours, or design your own home décor, you will want to learn how to use thickened dyes. Dyeing adds color, detail, and texture to fabrics. Thickening the dye makes this easy and gives you control with the application. It can be applied like paint: stenciled, stamped, brushed, sponged, and screen-printed. However, unlike paint the fabric remains soft and flexible. The workshop covers the basics. You will create samples you can refer to in future projects, learn layering techniques and ways to enhance your fabric. Whether you have a working knowledge of dye or are new to dyeing, this one-day workshop is a great way to discover the creative potential of thickened dyes. 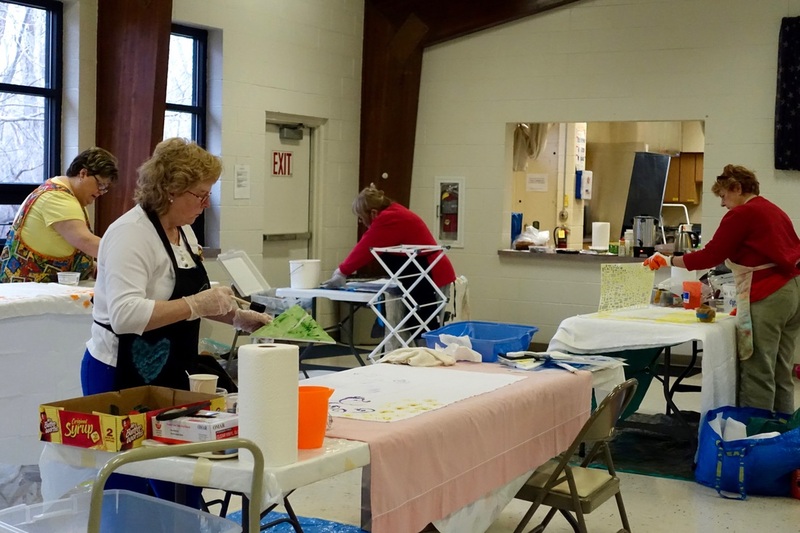 Learn how to make printing paste, chemical water, and mix dyes with activators. Make samples and label each technique for future reference: stenciling, stamping, sponging, and brushing. Create and paint a wash using the thickened dye and chemical water. Experiment with layering designs for visual texture. Experiment with the effect of dyeing on different types of fabrics such as cotton, rayon, linen, bamboo, silk, or blends, and on lightly colored or pre-dyed fabrics. Discuss ideas for further layering with enhancements: textile paints, Shiva Paintstiks, and rust dyeing. Handouts: “recipes” for dye printing paste, chemical water, list of resources, directions for batching, washing, and setting the dyed fabric. Class kit (student fee) - Includes dyes, printing paste, chemicals for activating the dye, chemical water, and small sponges/cups. Students share the dyes usually having one or two colors to work with at a time. Room requirements: Access to sinks and/or a utility tub and electricity. Tiled flooring is recommended. A table and chair for each participant plus three tables: for demonstrations, supplies and mixing dyes. Contact me for instructor/class kit fees and supply lists.